You’ve heard from George Payne on numerous occasions, recently in The Spirit of Corn Hill Lives: Photographing Rochester’s Most Historically Diverse Neighborhood. Throughout the year, George has written about and photographed the progress of the Lower Fall Foundation in making the Lower Falls Park and Gorge a World Heritage Site. 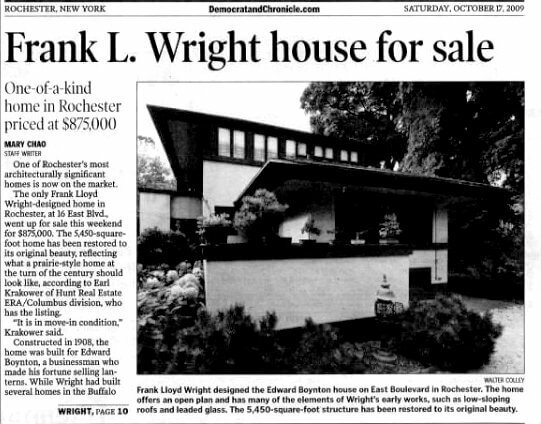 Today George turns his attention to Frank Lloyd Wright’s Boynton House in the Park Avenue neighborhood. I do not recall when exactly I fell in love with the architecture and philosophy of Frank Lloyd Wright; but I do know that it was likely around the time my father introduced me to The Fountainhead by Ayn Rand. As an innately rebellious 17 year old, this book, coupled with my growing awareness of Wright’s portfolio as an architect, shaped the way I viewed the world. From that point onward, creative integrity and professional autonomy became the two most important virtues in my life. To this day, every time I see a Wright building in person, online, or some place else, I am nostalgically reminded of Rand’s novel. I did not care then nor do I care now that this work of fiction has been panned by literary critics. Her book stirred something inside of me. 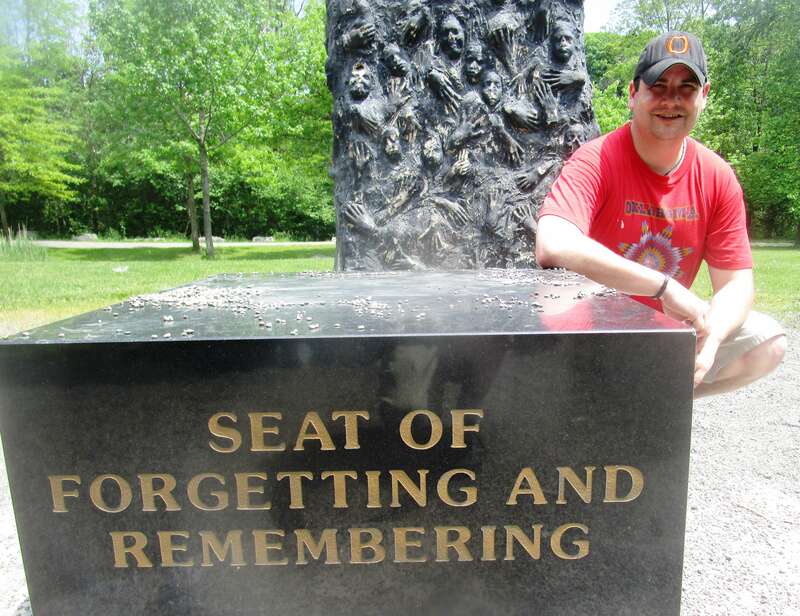 After I read it, I knew that my role in life was to become an intrepid adventurer of ideas. Like her protagonists, I wanted to become a living celebration of autonomy for the sake of autonomy. I am now 35. For all of the wonders and joys that come with my current position in life, many of these adolescent feelings have naturally faded over time. Although the spirit of Wright and Rand still call out to me, I no longer listen to them as I once did. Having said that, as a Rochester city dweller I am fortunate to have the opportunity to experience a Wright creation whenever I choose to. For the past decade or so, I have often walked or driven by the Boynton House in the Park Ave neighborhood. The Boynton House is not just a marvelous example of Wright’s Prairie Style (The Prairie Style), it is a mark of his sovereign genius as an artist working in a society established on mass conformity. Merely viewing this house as a casual pedestrian is enough to bring me back to that precious time in high school when everything about my self development was unlimited and possible. Edward Boynton was a successful lantern salesman and partner in the C. T. Ham Manufacturing Co. of Rochester. Boynton learned of Frank Lloyd Wright through a business partner, Warren McArthur. In 1907, Wright came to Rochester to help Edward and his daughter Beulah select a site for their home. Boynton bought four city lots on East Blvd., which would provide space for an expansive garden. The home is oriented sideways on the lot. The living room is extended west which aims towards the street. The dining room is very large and includes rows of leaded art glass windows on each floor, with separate designs for casements and clerestory windows and overhead light panels. The veranda was later enclosed and the same art glass added to it. The Boyntons lived in the house until 1918. 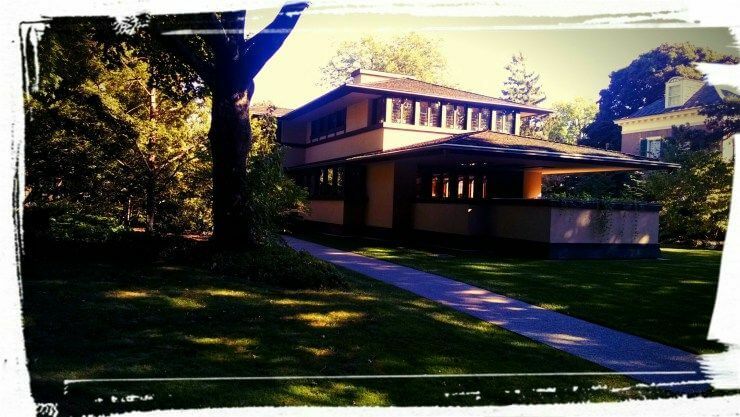 In 1932, Frank Lloyd Wright returned to Rochester for a lecture at the Memorial Art Gallery and was distressed to discover the gardens and tennis courts gone, the house surrounded by other homes, and the remains of the reflecting pool on a neighbor’s property, remarking “That’s the last time I’ll design for a space I’ve never seen. I thought it was sited on a hilltop surrounded by a stretching expanse of space.” After several owners, the Landmark Society purchased the house, then sold it with covenant to protect the exterior and interior, including the original Wright designed furniture, now owned by the Landmark Society. This home is still a private residence. As a result of harsh weather conditions in Rochester and problems with the original design, its upkeep has been a continual problem. An extensive restoration project (both inside and out) was completed in 2012. The two and a half year restoration project was undertaken by the present owners of the house, Francis J. Cosentino and his wife Jane E. Parker, who purchased the house in 2009 for $830,000. The house is part of the East Avenue Historic District, which is listed on the National Register of Historic Places. An abbreviated excerpt from the Wikipedia page on the Boynton House.